Setting up the Hubba Hubba NX is amazingly easy to do. 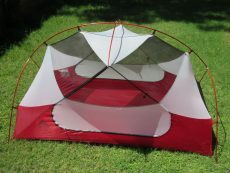 It comes with one many-segmented tent pole that has two end hubs and a roof cross-piece, that unfold to form an exoskeleton for the inner tent. Each corner of the inner tent is attached to a small piece of metal hardware with a hole drilled into it on one end and a webbing strap attached to the other, which is used to stake out the tent. The tips of the pole slot into these holes, easy-peesy, forming a curved arch that you attach the inner tent to using plastic clips. 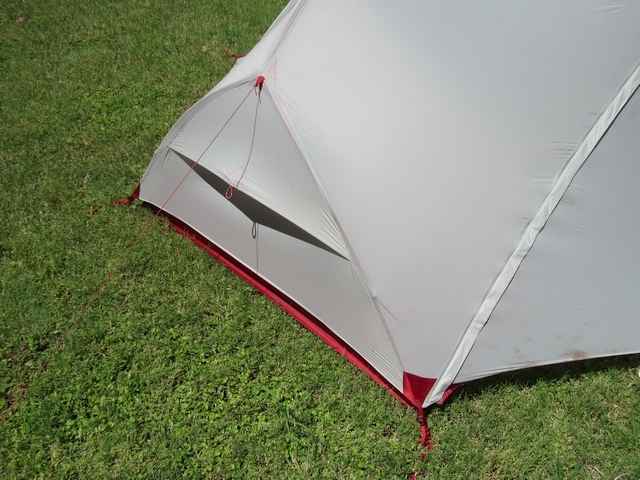 The roof cross-piece, which is attached to the long multi-segmented pole so it can never be lost, clips into two other plastic connectors above the inner tent doors. This long multi-segmented pole is a bit bulky to pack however, and is best stored on the exterior of your backpack rather than inside if you are short on space. It goes up really quick and you don’t even need to read the instructions really to figure it out. Instructions however are attached to the stuff sack that the tent comes in so you can’t loose them. The outer fly drapes over the exoskeleton frame, with color coded corners in grey and red, so you match the fly corners in the right orientation. The corners of the fly are color coded and have metal clips at the end, which fit over the ends of the pole tips, on the underside of the metal hardware where the pole tip sticks out. Once that’s done, you can stake out the corners and tighten the webbing straps on the inner tent and rain fly to tighten up the pitch. You don’t technically have to stake out these corners (this is the part of the tent that is “freestanding”), but it’s the only way to secure the tent to the ground in wind and to reduce the slack fabric in the structure. Fast Fly Option: It’s worth noting that you can just pitch the fly without the inner tent on the Hubba Hubba NX using the pole and the clip system described above. This means you can set up the fly first and the inner tent second to prevent the tent interior from getting wet, although you have to be a bit of a contortionist to do it. Still, it’s a substantial improvement over other tents that require that you buy and carry an additional footprint for their fast fly options, including the Big Agnes Copper Spur HV UL 2 person tent. Once that’s done, you can stake out the tent vestibules (the part that’s not “freestanding”, despite what MSR claims.) The Hubba Hubba NX requires a minimum of two tent stakes for the vestibules although you’ll normally want to stake out the corners, requiring at least four more. There are additional guy lines over the vestibule doors that you can stake out to give the tent additional stability in wind, as well as window vents at the end of the tent that help with airflow. MSR has also added “rain gutters” to the vestibule doors that are designed to keep rain from dripping on you when you unzip wet doors. These gutters are simply extensions to the fabric flaps that cover the vestibule zippers and help channel the flow of water running down the fly fabric away from you. More importantly, the zippers in the vestibules are oriented to run along the sides of the tent and not down the middle of the vestibule, making it easier to get in and out of the tent without having to crawl over your gear or brushing against a wet door: more evidence of how well this tent is designed. The Hubba Hubba NX has two doors, which I consider essential in a two person tent if you intend to use it with another person, so you can get out at night without waking your partner. Some people will argue that two doors are a convenience and unnecessary extra weight for a tent you just sleep in at night, but I’m not one of them. The interior of the Hubba Hubba NX is not tapered at the ends, but rectangular, giving the inner tent a very spacious feel. The ceiling is high enough to comfortably sit up in (34″ at the ends and 40″ at the center) and the near vertical side walls make it easy to move around inside without bumping into the ceiling. REI cites the interior dimensions of the Hubba Hubba NX as 84″ x 50″ (they’re not published by MSR on their website), but my measurements of the tent interior are 81″ x 48″ (since I measure the usable space in the tent interior when it’s pitched). 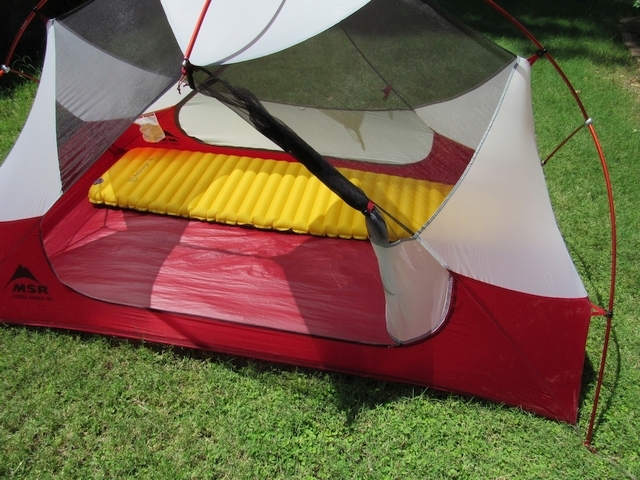 Either way, the width of the tent is snug when shared with a partner, and you’ll be hard pressed to fit two 25″ pads side by side without them bulging out the floor’s sidewalls. 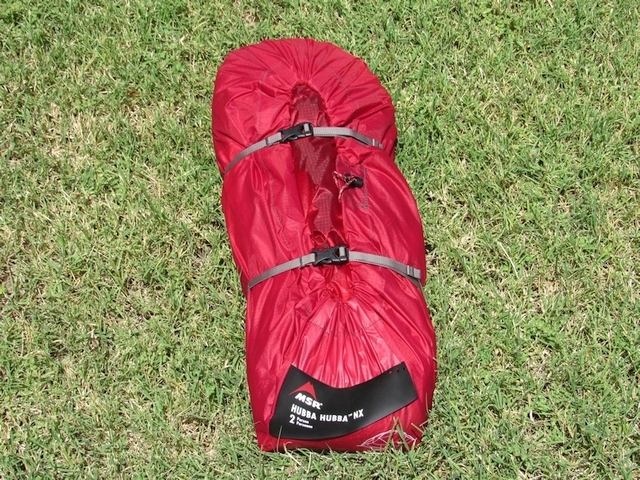 Most backpackers carry 20″ width sleeping bags to reduce weight, so this only becomes an inconvenience when car camping with more luxurious, 25″ or 30″ wide sleeping pads that many people bring on their camping trips. If you plan on doing more car camping, I’d recommend upgrading to the Mutha Hubba NX 3-person tent which is considerably wider (84″ x 68″), although heavy enough that you don’t want to take it backpacking. Internal storage inside the tent is fairly sparse, with one mesh pocket running the width of the interior at each end of the tent, below the end window vents. The interior is long enough however (81″ usable) that you can store a small amount of gear or clothing near your head/pillow for easy access. Plus the side vestibules are large enough to store high-capacity packs and not block door access. Interior ventilation in the Hubba Hubba NX is very good, provided you keep the vestibule doors cracked and end window vents propped open. The exoskeleton style architectures also keeps the rain fly off the inner tent, minimizing moisture transfer to the interior, always a problem when you have a tent with two adults sleeping inside in high humidity or rainy weather. The MSR Hubba Hubba NX is a two person camping and backpacking tent with a roomy interior that is exceptionally easy to set up. Featuring a rectangular floor, vertical side walls, and dual doors, the attention to details on this tent makes it extremely livable for two people out to enjoy a backpacking or camping trip. While it’s not the lightest, two person double-walled tent you can buy today, the 3 pound 7 ounce MSR Hubba Hubba NX strikes a superior balance between comfort, livability, and light weight. If you’re looking for a double-walled two person tent, the MSR Hubba Hubba NX is definitely the cream of the crop and is a good benchmark on which to judge other tents in this category. As one of the first tents to bridge a super lightweight design and good interior space, the Hubba Hubba has created a strong contingent of loyalists. There are, however, a growing number of competitors. 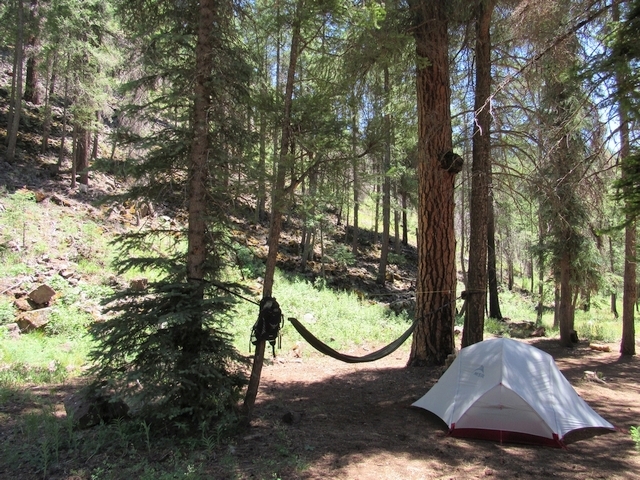 One of them is the Big Agnes Copper Spur UL2. It is considered to be the next step in going ultralight: it’s slightly more compromised than the Hubba Hubba NX in terms of fabric durability and interior space (the foot end tapers). 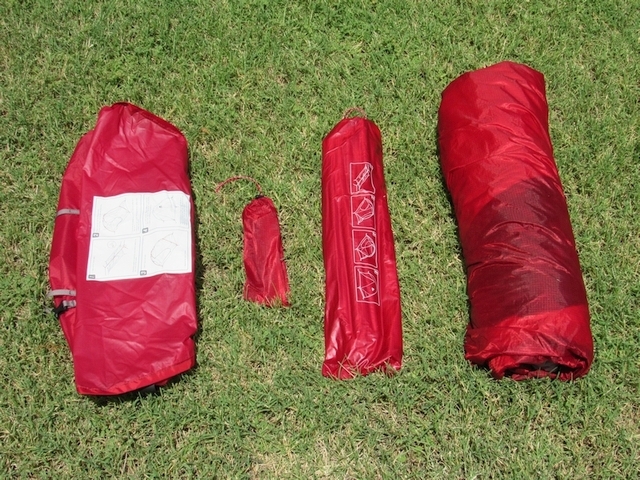 As such, it loses some of the balance that makes the Hubba Hubba such a great overall backpacking tent, but an 11-ounce savings is not insignificant. 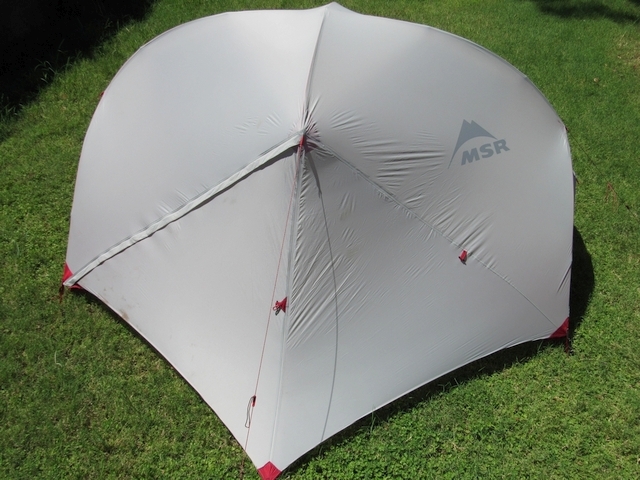 MSR have also released an interesting ultralight tent for 2016: the FreeLite. At 3 pounds (packed weight), it’s a whole 13 ounces lighter than the Hubba Hubba NX, and it retains the 2-door design and basic pole shape (although one end is not completely freestanding). To bring the weight down, MSR uses 15-denier fabrics for the floor and rainfly and has a 3-inch lower peak height – all pretty significant compromises. For most backpackers, price is the biggest obstacle in getting their hands on the Hubba Hubba NX. 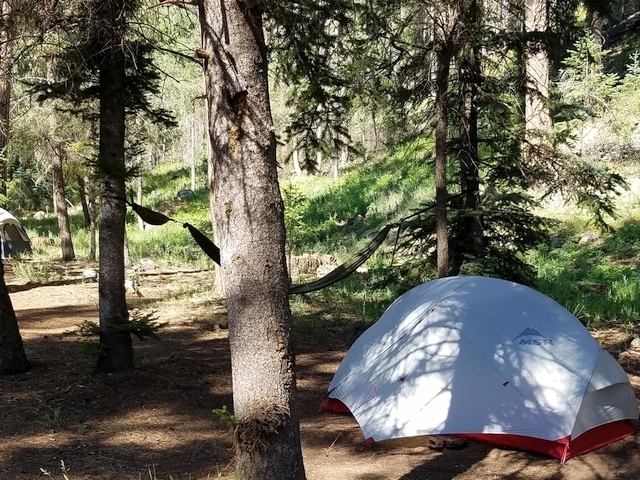 A better option for summertime weekend warriors might be this Kelty Salida 2 tent, which comes in at a more wallet-friendly price. But the dedicated backpacker that likes to move light and fast and still wants a stable, freestanding setup will be very pleased with the Hubba Hubba NX. 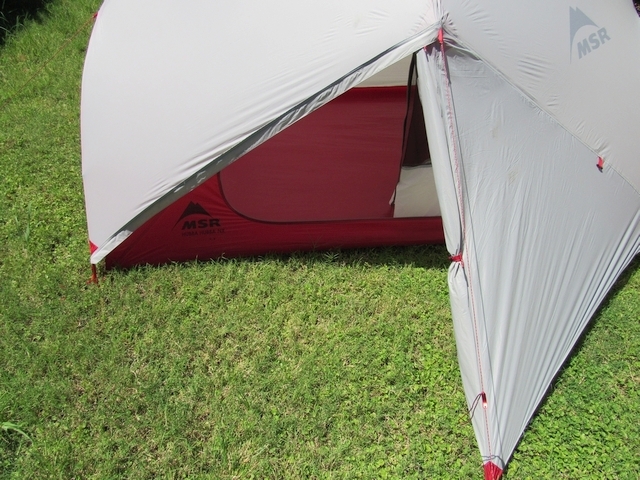 $400 might seem like a pricey option, but you can find this tent on sale very often. I was being patient and ended up buying it on Amazon for $270 in March 2017. For the whole package of weight, livability and toughness, I consider it well worth the money.